There is no better chair to represent Halloween than the modern Ghost Chair. The only thing that can make them better is to pair them with a clear acrylic side table. 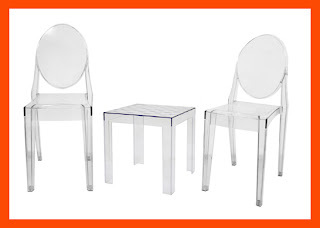 The Ghost Chairs below can be picked up new for $81 or as an open box item for $49. 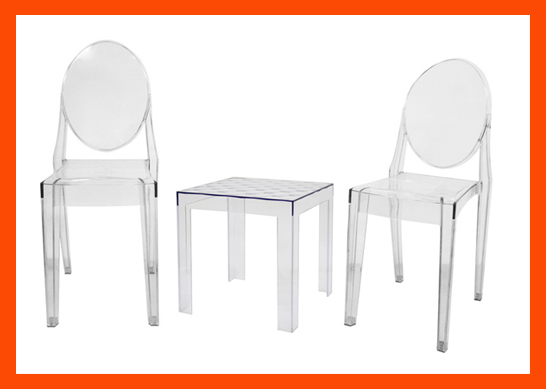 Made of transparent acrylics, the chair is sturdy and durable even as it displays a delicate, ethereal appearance. This pair is likely to sneak up on you if you are not paying attention. This just as spooky end table can be yours for $54. If you are looking for a slightly larger chair with a dining room feel, pick up the Armed Ghost Chair. Take home this chair new for $85 or as an open box item for $62. Sitting next to this seemingly floating end table, this set has a Halloween feel. We currently have one of these tables on the outlet floor for $119. 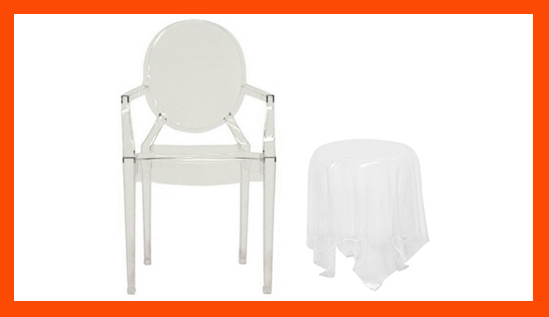 These clear Ghost Chairs do not stick around our outlet for very long. Just as fast as they show up they are gone. So don't take your time getting over here, you might just miss out.